The minute you hear a sneeze, sniffle or a cough... the count down of when your kid will be infected is on! It seems that the schools are sending more and more notes home about illnesses in the classroom. We all try and do are best to prevent illness, but sometimes there is nothing you can do to prevent it! Pfizer Pediatric wants to help you get prepared for the fevers, coughs, and colds coming your way this season. Did you know that Target has all of the Pfizer Pediatric products you need to fight against the “ick’s” and “ew’s” that bring your kids down. I love being able to find these great products at one of my favorite stores, let alone save some money in the process! We always have products like Children’s Advil®, Children’s Robitussin® or Children’s Dimetapp® on hand. It is better to be prepared, then have to run out to the 24hr store at 2am, when your child wakes up to tell you they don't feel well! Recently my son came down with a fever and was run done. 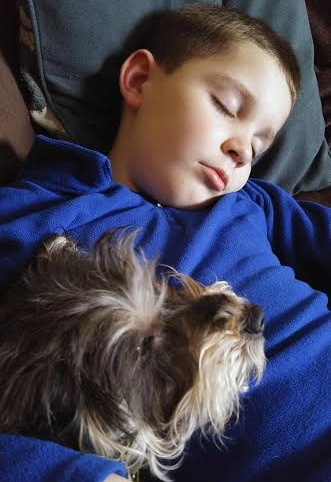 I was thankful to have Children’s Advil® on hand to help reduce his fever. With lots of snuggles, liquids and rest he was back to his normal self in no time! 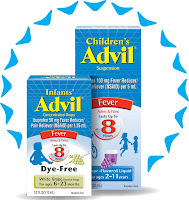 Infants’ and Children’s Advil® - Ease those aches and pains, while reducing a child’s fever fast with Children’s Advil®, a great solution for kids as young as 2 and up to 11. Children’s Advil® comes in several great-tasting flavors, including: Sugar-free Dye-free Berry, Bubble Gum, Grape, Blue Raspberry, Fruit and Dye-Free White Grape flavors. There’s also Infants’ Advil® White Grape, which provides unsurpassed fever relief among OTC pain relievers with a syringe for easy dosing for children 6-23 months. 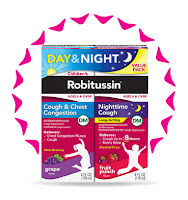 Children’s Robitussin®: Formulated just for kids, Children's Robitussin® DM Day/Night Pack (Children’s Robitussin® Cough & Chest Congestion and Children’s Robitussin® Nighttime Cough for ages 6+) non-drowsy daytime formula helps break up chest congestion, while the long-acting nighttime formula relieves coughs and runny noses to help kids get the rest they need. 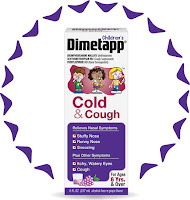 Children’s Dimetapp® - All in a great tasting grape flavor, Children’s Dimetapp® Cold & Cough tackles a child’s most bothersome stuffy and runny noses, all while working to relieve cough, for ages 6+. In addition to having medicines on hand to combat the ickies, a lot or rest and snuggle time is important. What better way to relax with you littles then quiet time snuggling on the couch while watching a 20th Century Fox movie! There are so many great films at Target and the following three are on sale plus there is a Cartwheel coupon for each one! Ice Age Collision Course: Your favorite ICE AGE heroes are back and cooler than ever in this all-new animated adventure that’s mammoth-sized fun for the whole family! Now the entire herd—including Buck, Manny, Ellie, Sid and Diego—must work together on a hilarious journey filled with nonstop action and colorful new characters, in order to survive the global Scrat-tastrophe! The Sandlot: Tom Guiry plays Scotty Smalls, the shy new kid on the block who wants to join the rowdy pickup baseball team that plays every day in the neighborhood sandlot. The summer passes blissfully as Scotty learns to play ball under the wing of Benny Rodriguez (Mike Vitar), the oldest and best player, as well as Ham, Squints, Repeat and the rest of the kid-eccentrics. The skies darken, however, when Benny literally knocks the stuffing out of the team's only baseball, a sign of impending doom, or worse, bad luck. Wanting to set things right, Scotty returns home and "borrows" his stepfather's ball, which he promptly uses to hit his first home run, knocking the ball clear out of the sandlot into mean old Mr. Mertle (James Earl Jones)'s junkyard, home to Mertle's legendary guard dog The Beast. Looking to save some money, then head on over to Target. Right now there are some great Target Cartwheel coupons available! Plus this week until 02/18/17, Target has buy 2 movies get 1 free. Just think of the savings you will score! Sick just got real.™ website - valuable information including sick hacks, sick sense relief finder and more!